No this is not a statement from a fringe group who are avoiding the frayed nerves and expense associated with Christmas Shopping, cooking, boisterous children and upset tummies. Christmas is a time where a million and one things must happen and be in place (more or less) by the time presents are unwrapped on Christmas day. To be honest most of us manage it. We enjoy (or tolerate) the influx of friends and family and for once we seem capable of multi tasking i.e. having a drink, fixing the tree, carving the turkey. Using Christmas as a metaphor, why can’t we do all these things in the workplace? Why can’t we encourage diversity, set objectives, plan and execute strategies? A subtle clue might be in where the focus lies. As individuals, who do we focus on at work, who do we focus on at home (especially at Christmas)? Now think about where the most dramatic results are achieved! The list could be endless. There is a serious point to be made though. Yes we do need some frameworks to work within, and for someone to look out for the less fortunate and disadvantaged, but too many rules and too many people saying NO is stifling. So its time to decide whether in 2011 you wish to embrace a more creative and productive way of working or wither away under a pile of rules and red tape. Remember, if Christmas really was like work, it would be cancelled. Long live Christmas! On Thursday 4th Nov, 2010 I travelled to Iran to speak at a number of seminars and conferences with speaking colleagues Larry Hochman, Kevin Kelly, Richard Denny, Paul Sloane and Sylvia Perreault. The following text attempts to illustrate the highlights without passing judgement or opinion. Overall a great trip, interesting people and huge potential for the country. Their are of plenty of obstacles in the way though. Other good news is a measurable weight loss and a drop in trouser size! A long drive from Cardiff to Heathrow, a bit wet on the motorway. Arrived in good time to check in around 3 hrs before flight. There was a notice at check in saying that we were going via Hamburg to get fuel. This is because of sanctions against Iran.Why does the UK government do this, it is pointless? Iran Air is a little no frills but clean and very polite. There is no in flight entertainment but everyone is quiet and the children were exceedingly well behaved. Could the calm be a result of no drinks trolley trundling up and down the aisles? First plate of food was a rather chewy cheese roll but thankfully this was just to tide us over to the fuel stop in Hamburg. I managed to get a can of coke that had been turned into ice somehow! Some part of that plane was a little cold. Actual meal was better than most aircraft meals that I have had. Arrived in Teheran. Met by Moss, Hossein and Mehdi and then driven at high speed to Mehrabad airport for a flight to Isfahan. Other speakers arriving on the BMI flight were delayed and in danger of not making the Isfahan flight. Luckily the flight was delayed by fog for around an hour and a half so we did manage to join up. Isfahan was very pleasant, sunny and around 10 degrees. Introduced to Beni, our 'minder' for the next few days. It is useful to have a good english speaking person to accompany you who can show you the local sights and help 'colour' your picture of Iran. Hotel Kowsar billed as 4*. I don't think that it quite makes that grade but it is spotless and everyone pleased to see us and be helpful. Drank a lot of tea and slept a lot before dinner. Had dinner in hotel restaurant with the gang and then went for a walk with Paul and Beni. Bumped into a couple of Beni’s friends Sohail and Reza who were out cruising in their car. Reza was highly ranked at Tae Kwan Do so he was to be my friend if I got into any trouble. We walked across one of the many magnificent bridges spanning the river. Plenty of people out but completely safe. The traffic on the other hand was something else! Iranians seemed to have developed a unique blend of walking, talking on their mobile phones and body swerves that allowed them to cross the road with ease. Noticed that the bank next door to the hotel was named the Tat Bank – an unfortunate name. In bed by 10:30pm and slept like a log due to fresh air and excitement. Went to an extraordinary meeting with Mr Yazdanpanah, the MD of Lahzeha. His business is wedding photography and videos but with a certain wow factor. He certainly knows his stuff and the products are amazing. What followed was a little surreal as his staff photographed and video'd us doing just about everything! It was like having paparazzi follow you. The lunch that followed was great and then soe free time, bliss. Tomorrow night we are having a party at the premises of the owner of Lahzeha. Don't know what to expect but looking forward to it. Ate in the hotel restaurant tonight but went out for a long walk afterwards taking in some delicious saffron ice cream and also a stroll up to the Abbasi Hotel. The architecture is superb. Each time we go out we are introduced to business associates and cousins. Is everyone in Iran related? Lovely people though. Went on a tour of Isfahan with Beni and Paul. Saw Chehel Setoun Palace and Abbasi as well as Imam Mosque and Imam Square. The latter has bazaars/shops by the hundred all making incredible textiles, metal an enamelled goods. There is huge potential to make money from tourists here! Went to a well hidden café where you can smoke the 'shisha' pipe. Beni told us that this is what they call it but it is also the name for an illegal drug! Best stick to the arabic hookah I think! Went in the section with the ladies and took tea and smoked the pipes. Had our piccies taken their too! Very Persian and thoroughly enjoyable. Back to the hotel for a rest, a slice of apple pie and catch up with home. Mr Y's party turned out to be a small gathering at his garden out in the countryside. What a place! A nice crash pad but I was not sure about the collection of motorcycles. First speaking date in Isfahan. Venue is Isfahan Chamber of Commerce and is splendid. Because of the nature of the event timings went a little awry. It was a longish day with a late dinner. Despite being briefed by Kevin about being mobbed and people wanting photos I was surprised by the attention. Is this what being a rock star is like? I am told that things may get more intense in Tehran. Still giggling at the sight of the audience being taught Irish dancing by Kevin! Better organisation today. Stayed at the hotel until lunchtime and then went with Kevin to the venue just before lunchtime. Just in time for more kebabs! Audience were much more enthusiastic and appreciative. It was a shame that we had to ruch to catch the plane to Tehran as the crowds were even bigger. We had to fend them off and make for the exit. It would have been nice to chat but there was not the time. Flight to Tehran passed quickly but back at hotel late and went for a snack with Sylvia and Richard. Tried Skype and it worked for a while but felt as if the internet was turned off at midnight! Lousy night’s sleep. Woke up with a headache a gulped a couple of ibruprofen before having a chat with a colleague in Mexico and catching up on my Iran diary. Feels like I should sleep for most of the day! Went sightseeing and had a peek at the Golestan Palace, the Den of Espionage (former US embassy) and also Azadi Sq. The paintings on the wall of the former US embassy are great but I can see how it would upset the USA. Saw revolutionary militia dressed in black riding on their motorcycles in large numbers near Tehran University. Very scary indeed! Another bad sleep. Up at 4:15am instead of 5:30! Had brekkie at 6am and was ready to go to conference venue at 6:45am. Shame nobody else was. We left a little late but the start was delayed anyway. Venue very posh and I have a badge which says ‘keynote speaker’ on it – cool. First speech very good I thought but second did struggle a little as audience had a problem with the concept of time travel (or my explanation of the activity). After second speech Mehdi sold all of my CDs plus copies of the PDF files, brilliant! Dashed out at 5pm and returned to hotel to check out. Off to Mehrabad airport for flight to Mashhad. Translators did not make the flight for some reason but one seems to have been found. Mahan Air much better than Iran Air and we were greeted by the event organisers with roses. Temp was lower but air is clean. Reminds me a little of the north of Thailand. Hotel basic but comfy and spacious (we have suites) so down to tweak PowerPoint, have a cuppa and off to bed. We now have a new translator who has never done this before but his english is good and he is keen! Also the conf venue does not have a translation booth. We start off with translator in a different room for my first slot, not brill but ok. For Paul we move translator in and he has to do one sentence at a time. Progress, things go better. In the meantime our powerpoint is translated in Farsi and so my second session goes much better. Q and A session could have carried on all night as could photos. Translator helped by lovely lady Negin. Went into Mashhad itself with conf organiser Mr B and his wife. Went to trad restaurant where you sit on a raised floor. Food brill but we managed to innovate the cooking! One of the dishes we had was supposed to be eaten with bread but Paul and I ate it with rice. They told us that this was odd. We just put it down to innovation. Negin met us afterwards and we all went to Haram to the shrine of Imam Reza. Paul insisted on seeing everything and led us around with the guidebook! Nagin wanted us to go to her garden for tea which was miles out of town but very pleasant. I fell down a hole next to the swimming pool! We had 6 people in Mr B’s car and he drove like crazy. It was fun though. On arriving back at the hotel Mr B presented us both with gifts. A nice thought but I am not sure how to get the picture back to the UK. Left hotel with very little time to spare. Mr B and wife insisted that they drive us to the airport but they stopped on the way for a pressie for John. Nice but we only just made the flight. Disturbing scenes of martyrdom on posters at the airport. Ok flight back to Tehran and then transfer to Hotel Howeyzeh. Great lobby set in a timewarp and efficient staff. Rooms sparkling but bathrooms have 'exciting' plumbing. Tested the air con and I can say that the air con in every hotel room that I stayed in did not work! Had lunch with Paul and Moss then went to sleep after trying the internet access (free – great). Met with Moss, Hossein and Mehdi, Paul and Richard for meal in the coffee shop. Only food was pizza and the oven only takes 3. Alas the 3 Iranian guys were forgotten and only got half cooked pizzas in the end. Still have not found out the Iranian equivalent of manana . An early night was called for with a 4:30am start the next day. Up at 3:30am in order to leave the hotel at 4:45am for the airport. Trip to airport only takes 35 mins and then Mehdi has a disagreement with the taxi driver! Mehdi takes us to the currency exchange where the inhabitant is asleep with his feet up. On being woken he says the exchange is not open! We go through security and then try the Meli Bank. They do change our money but only to Euros not sterling. We check in and then go for a coffee. Richard appears as the business class lounge is rubbish – there is a god after all! Flight is uneventful but we notice as that as we get further from Tehran the women begin removing their scarves! Back to reality in the UK! Much has been written about bullying within organisations. Depending on which survey you read, statistics show that anything between 30% and 50% of workers are affected. The large spread may even be indicative of the fact that in some countries and cultures, workplace bullying is under reported. It goes without saying that this topic should be addressed purely from an HR point of view, but what else is it doing to your organisation? On a personal level, bullying directly affects the motivation of employees. The effect on extrinsic motivation may simply mean that as an employer you notice a decrease in performance. Intrinsic motivation will also suffer as employees ask ‘why should I make extra effort at work?’ As an employer there is a double whammy here if you are not seen to be tackling the issues. Along with knowledge and experience, intrinsic motivation is one of the biggest drivers of Creativity on a personal level so ignore bullying at your peril. Creativity is also one of the major components of Innovation, something that many of us strive for in the current tough economic environment. One of the underlying principles for embracing Creativity and Innovation is the new type of ‘network’ that needs to exist within our organisations. It is more informal than those shown in structure charts and helps us to share ideas and expertise. These networks are ‘soft’, they are not built from cables and computers, and they incorporate real people, your employees. Such networks are built on trust and sharing and are of course easily damaged by systematic bullying i.e. bullying that is not personal but which is accepted as the norm. There are so many more things that you could also be damaging by ignoring individual and systematic bullying such as team working, scanning your external environment, developing initiative, organisational learning and decision making. ‘So what?’ you may say ‘Why should I care?’ To answer this simply take a look around you. The world has changed and to cope with the changes you need to change too. Old fashioned change management is not as effective as it used to be and to continually demolish and rebuild your organisation structure is expensive. Wouldn’t it be nice if you had an organisation that changed according to its environment, that could change shape and function as the economy changed, and which could, as part of its normal day to day operation generate ideas for new products, services and processes? This is all possible, from the smallest business to the largest most bureaucratic government department. But you will never achieve any of this if bullying or harassment is rife within our organisation. Apart from physical or verbal abuse, this also includes deliberately delegating boring tasks, not carrying out annual reviews or withholding professional development opportunities. Get started now before it is too late. You owe it to your employees and the other stakeholders involved in your business. That’s guerrilla not gorilla, although I’m sure that apes are very creative in their own way. Have you ever been on a course, say project management, leadership or even assertiveness and then wondered why you had such a hard time dealing with colleagues or perhaps loved ones when you returned? What is your reaction when a colleague returns from a course? At a guess you say to yourself “don’t you try any of that stuff on me, I’m not going to succumb to your tricks or mind games”. Despite the fact that most of us are responsible adults, we become childish when we think someone may be trying to influence us. The question is how to use our new found skills without anyone noticing. The answer is of course not to tell anyone that we are using our newly acquired skills! When introducing creative thinking techniques the problems are usually made worse by colleagues thinking that they will always be outside of their comfort zone and then battening down the hatches and resisting all your attempts to involve them. First of all your colleagues only think that you are trying out a technique or showing them how to use it (which of course you are) and secondly they will jump in because they of course do not wish to be seen to be negative themselves. This type of approach can be used in all sorts of situations. This is guerrilla creativity, sneaking in by the back door, and it works. This is not an attempt to malign the use of crowdsourcing as a valuable technique, it is simply a way of pointing out that it is not a ‘cure for all ills’ as some people seem to think. Any technique used incorrectly or inappropriately can be at best ineffective and at worst damaging or disruptive (in terms of both cost and reputation). Following the recent election and subsequent formation of a coalition government here in the UK, much was made of the need to consult widely and get the input of real people to help in the formation of government policy. Ignoring the fact that this was probably a political ploy and that nearly all of the suggestions collected have been ignored completely, this was never going to work. But why? The first (and possibly least important) reason was the method of idea collection. Simply gathering ideas electronically via bulletin boards or email is a very blunt instrument and places limits on how much people can say. Neither does it allow other contributors to build or add to the contributions of others. This would be a very good time to build a huge virtual nominal group! Secondly, the biggest error when attempting to make radical (or progressive as the government labelled them) changes is to consult those at the sharp end, the people who are involved in day to day delivery. This seems harsh at first, but if you think about it the resulting ideas are not likely to be radical, just ways of trimming costs or reducing waiting times. The question for this group of people is ’what should the service look like?’ not ‘how should the service be delivered?’. These people can still participate in consultation but with a different label. They need to take a step backwards and see the bigger picture. Rather than try to trim money from everyone’s budget, a holistic view is needed. Just as in a business when Marketing and Finance are no longer contained entirely within their respective departments, our new government should take a wider view. The questions should be ‘what is the best way to provide relevant education for our children?’ rather than ‘how can we keep exam grades up and chop 40% from the budget?’ To answer these types of questions simply asking people their opinion will not do. Maybe this is not coalition thinking and radical and progressive politics really are not on the agenda. It is not often that I get particularly angry about customer service, perhaps because I do not receive appalling service too often. Most cases of bad service seem to be reported to me by others. This week I was on the receiving end. So what happened? The hosting for one of my web sites was coming up for renewal. The reminder simply informed me that the hosting was up for renewal on a particular date. Now you may or may not know that 123 Reg liek to set up services that 'auto renew'. They insist that you supply details of at least one credit or debit card and will automatically take payment unless you set the service not to auto renew or you inform them otherwise. This is the situation now. Last year it was not, if I had not renewed my hosting manually it would have lapsed and foolishly I assumed that this year it would be the same. Anyhow, I moved my site and on the day I thought my old site would disappear I received an email stating that the renewal had been charged to my credit card. That very day I contacted 123 Reg pointing out that the system had changed, that I had already changed nameservers and moved the site (so I was not intending to use the hosting) and that I was not trying to use a service for which I had not paid. Those who have had dealings with 123 Reg will recognise the sort of reply I received. It is not company policy to refund auto renewal premiums. So I got back in touch and asked where was the online facility to stop autorenewal for hosting (there is one for domains) since telephone support is difficult to come by and costs 10p/minute. Apparently I have to submit a support ticket to stop autorenewal! Gradually the spaces betwen interactions got longer and longer, same replies but from different people 'ample time to cancel ...., contact customer service .....'. The support thread is still open, maybe they hope I will just go quietly crazy? Anyway, I have now paid for hosting that I don't need from a company that is poor at delivering so what do I do? Well I bit the bullet and organised the mass transfer of my domains to a new registrar and when the transfers are complete I will tell them (not ask) to cancel the hosting, delete my credit card details etc and close my account. A Google of 123 Reg issues reveals that I am far from alone. Sites have been deleted and many fees wrongly taken and not refunded. Many fees have also been taken and domains not registered. So, 123 Reg, your customer service is truly appalling. On the other hand I can thoroughly recommend www.nethosted.co.uk. They will go the extra mile at almost any time of night or day, I think the longest I have had to wait for a response to a query is an hour, 20 minutes has been pretty much the norm. If you are consudering using 123 Reg then avoid them like the plague. There are plenty of much better alternatives out there. Recently I encountered a very interesting take on the idea of rules whilst watching Stephen Tomkinson's Australian balloon adventure on ITV1. In Melbourne there is a road called Hosier Lane where many graffiti artists work. The mere thought of graffiti signals anarchy to most people or perhaps fond memories of Banksy. Hosier Lane is completely covered in graffiti and it was intriguing to note that there are 'rules' that govern the whole process of applying graffiti. First of all there are real regulations about who can actually spray paint (you need a license), what types of paint you can use etc. then there are the unwritten rules. For instance, who decides when it is allowable to paint over existing graffiti? It seems that the rules make themselves. If a work is greatly admired then it will survive for a long time, if not and other tags or drawings encroach on it then that is the signal for some urban redecoration. It is also allowable for existing works to be enhanced by adding to them, perhaps a butterfly tastefully applied. Now let us step back in time and imagine what sort of discussions took place when the graffiti was first put there. All of the existing rules would have been applied in rapid succession to see if a) there was an applicable rule b) it was possible to ban/remove graffiti if the need arose. I can imagine that various regulations covering hazardous substances (paint), planning, safety (crowd control, police) were pored over before someone realised that Hosier Lane was actually a tourist attraction. So if this street was a street artist's canvas, what rules can/should be applied? The answer is of course ones that apply to the graffiti itself and those who put it there, subject if course to normal rules regarding decency and other the rights of others not to have graffiti in their street. So when your organisation decides to embrace creative thinking you will most likely encounter new situations that you need to deal with. Don't be alarmed, just involve the appropriate people and do not try to make your existing rules fit, they will restrict your creative output. As Albert Einstein noted, a problem cannot be solved within the same frame of reference in which it was created. This does not mean that we have to employ Einstein's methods and shift ourselves into outer space or become time travellers, it simply means that our problem must be reframed or looked at in a new way. You can get someone else to look at your problem or just change your own perspective. My good friend Gerardo Porras, based in Mexico, created a very useful metaphor for this very situation. We are inside our house looking out and what we see is governed by the shape of the window and the colour of the glass. To add to this metaphor, our view through the window is also governed by the laws of physics, we can only see what is in our line of sight so to look in a different direction we must choose a new window. We could of course leave our 'house' and take in all of the scenery by turning around and looking in every direction. If we were exploring then that is exactly what we would do, but within organisations we need to make decisions and too much information can make those decisions difficult to take. So whilst we might need to change the way we look at a problem in an organisation, generating too many options or business ideas may be unhelpful. Once you get the idea, you can soon work out your own ways to change your perspective. This article carries on from a previous post on Serendipity. If you missed the post read it here. Ensure that the goals of your business are aligned with the values, interests and actions of your employees. The Japan Railways worker was all for removing water, he just had a different solution for doing it and he knew that his idea would be taken seriously. Encourage initiative. Allow employees to pick problems that they are interested in, which in turn increases intrinsic motivation. Employees will put in extra effort or time if they feel it is worth it. Unofficial activity (or skunk works) occurs in the absence of direct official support. When an idea is new to a company there is often resistance. Unofficial activity gives ideas a safe breeding ground where they have the chance to develop. Official recognition can raise all kinds of barriers to creativity when managers plan and scrutinise every step. When employees are free to experiment beyond the boundaries of their job descriptions, this is often the time for unexpected connections. A serendipitous discovery is one made by accident in the presence of insight. Creativity often involves making connections between things that may seem unconnected. The more obscure the connection, the greater the role for the unexpected. With insight we help bridge the gap, we do not need to leap quite so far. An excellent example of this was the discovery of penicillin. Use diverse stimuli. A stimulus either provides fresh insight into something a person has already set out to do, or it provokes an entirely new course of action. We must remember that it is hard (even impossible) to predict how individuals react to new stimuli. So once again we must expect the unexpected but a word of caution, mass applications of stimuli have a limited effect. Bringing people together to share experiences of such stimuli is much more beneficial. Develop a soft infrastructure. For corporate creativity official channels of communication are of limited use. We need networks where knowledge and intuition can slosh about, crossing departmental and functional boundaries. Good examples are those coffee machine or water cooler moments. Smaller companies seem to be able to create or foster such networks but larger companies have difficulty. The larger the company, the more likely that the components of creativity are present somewhere in it, but the less likely they will be brought together without some help. Well first of all it is a good, no really great, idea to have a good idea! Sounds silly but many ideas are just that. I could have a really great idea about growing bananas underwater but something tells me that I would be wasting my time. When the go/no go decision is a little less obvious we must be a little more logical about testing for a good idea. What problem (or business pain) is your idea targeted at? Is your idea well formed or do you have more work to do? Do you understand why your idea will appeal to potential customers? When you tell people about your idea do they get it immediately? Do you have a prototype or have you conducted a trial? Have you received positive feedback? Have you costed your idea, what will you sell it for? How will you make your product or deliver your service? Do you have the necessary skills and resources or will you buy them (where from)? Have you checked that nobody has done this before? Do you wish to retain ownership of your idea? You may well have further tests in an organisation specific context e.g. does this fit with strategy or existing products but these are a good starting point. It is always best to test your ideas to avoid wasting time in a commercial environment. If not you may simply be playing. I have heard this before, but in this case I hold up my hands and say that I used creative swiping and stole the title from Sir Richard Branson. You really should read his interesting article on the topic. Branson makes a very interesting point about fear of failure but how can innovation actually fail? It is quite simple, the only way is to DO NOTHING. Innovation is all about getting things done (or trying in the case of Virgin) and learning from the result whether it is success or failure. This way you can a) try again or b) use your acquired knowledge in some other way. The route forward may not necessarily be a straight line but you will move forward and potentially gain competitive advantage. Thomas Edison is reported to have made over 2000 attempts at creating the first light bulb. His view of this was that he found 2000 ways not to make a light bulb. Imagine that there was no patent and a competitor had no knowledge of what Edison had done. Even if Edison was on attempt 1999 he was still 1999 steps ahead of his competitor, none of which he would have made without failing!! but first of course you must actually do something or you are guaranteed to fail. Lets face it, most of the economies around the world have been in deep trouble for a couple of years and the problems do not look like they are going to end soon. We have politicians talking of radical reforms, new beginnings and innovative policies and then at the bottom of the chain there is us, the businesses both large and small that the politicians are betting on to help dig us out of the mess. A lot of companies are making the right noises and I have contact with many who state that they wish to run 'innovation workshops', kick off an 'innovation programme' or make their business more creative. They all seem to appreciate that taking some action will improve many HR issues such as intrinsic motivation, communications and decision making to name a few. These businesses all claim to be looking to the future, to determine what the products and services of the future will look like and meet that challenge. So senior managers, and above, are tackling strategic issues and seeking for the most effective tools to get the job done. Why is it then that when presented by a number of solid proposals that they do not go ahead? Mysteriously something comes up at the last minute, people cannot make the workshop, the cost is too high or best of all something more important has come up! What can be more important than the future of your company? The worst offenders seem to be large multinational companies with a degree of financial inertia (maybe some cash in the bank and the ability to sit it out and see the competition wither) who elect to ride out the storm rather than steering around it. These companies need to be showing us the way and leading global recovery or else we are just going to be left with a handful of dinosaurs in sectors such as oil and gas, power generation and airlines. So, my plea is, if the future really matters to your business then take Business Creativity and Innovation seriously and give it the time and funds that it deserves or you may not have a future. Serendipity was not a word that was in my vocabulary for a long time. I first encountered it whilst studying for my MBA and initially I took it to mean ‘good fortune’. To many this definition suffices but as far as exploiting serendipity in a corporate context is concerned there is much more to it. Managers in most companies are aware that as far as creativity is concerned, potential (often greatly) exceeds performance. They are aware of the problem but are not sure exactly what they should do about it. Many creative initiatives are planned (are these truly creative?) and a large number are spontaneous. They often hit us when we least expect it and we are unaware of what form these events will be, where they will come from and who might get tangled up in them. If the truly great potential is in the unexpected then what can be done to harness or capture the power of the unexpected? A simple but powerful example of the power of the unexpected comes from Japan Railways. During the construction of a tunnel through Mt. Tanigawa engineers encountered many problems with water. Just as they began to provide a traditional draining solution enter an enterprising railway worker. He thought that the water tasted so good it ought to be bottled and sold as a premium brand mineral water rather than simply pumping it away. And so “Oshimizu” was born. It became so popular that Japan Railways installed Oshimizu vending machines on every one of its nearly platforms. Marketing material emphasises the purity of Mt. Tanigawa’s snow which is the source of the water and also the slow percolation through the rock which adds minerals. The product grew to include juices as well as iced and hot teas and coffees. By 1994, sales of Oshimizu branded drinks had risen to $47 million. A natural tendency of management is to believe it’s more in control of events than it really is, or that it really needs to be in control of everything. Hence the proliferation of myths that hide the true source of creativity and the manuals and systems that allow management to successfully manage creativity. We are all told that to be creative we must suspend our critical thinking. So if we all rearrange our office furniture or let our emails pile up for a day our companies will be brimming with creativity? So Luck or Skill? Well as we can see from the Japan Railways example an unexpected event is nothing on its own. We need luck and an ability to react appropriately in a corporate environment. Coming soon ... Six Steps to Turn Luck Into Profit. Many of you will be familiar with Scott Adams’ naive and downtrodden cartoon character Dilbert who sits in a small cubicle all day working for a tyrannical boss. If you have not seen Dilbert before then take a look at www.dilbert.com. On last year’s calendar there was a scene where Dilbert and Dogbert were looking out over a panoramic scene. Dilbert said “wow look at that!” and Dogbert’s reply was “look at what?”. There are times when we look at an issue with our colleagues and wonder why they cannot see the same things that we do. Have you ever been house hunting with someone who raves about the kitchen whilst you rave about the workshop or games room? This is much the same thing, we can all look at the same thing and see different facets or sometimes, like Dogbert, nothing at all. I want to write upside down – do I need to design a pressurised pen or will a pencil do? So try changing the way you look at the world and marvel at the increased opportunities. Those readers in the UK who have watched ITV's world cup coverage may have enjoyed the moving theme tune which is a special recording of When You Come Back by South African artist Vusi Mahlasela. Click below to see him play at the Live 8 concert or for a more powerful performance at Nelson Mandela's 90th birthday. For those people who have yet to get to grips with using Creativity and Innovation to gain greater success in business here are a few things worth thinking about. For those of you that have, then you should look at these issues and feel proud that you have overcome them! How true! Whether you think about one off characters such as Richard Branson and James Dyson or gangs of people that work for Google or Apple it is highly unlikely that your recruitment procedures would result in you recruiting these people. HR departments can get so fixated on employment law that they do not act to recruit and retain the best human capital for your business. Yet another issue to grapple with. We can have a stab at what the future holds (futures is a brilliant use for alternative thinking) but even without this, we do know the sorts of skills that our workers must have and the types of behaviours that they should exhibit. Our workforces should be matched to these criteria and be able to learn readily and tolerate a degree of ambiguity. But if things cannot be cast in stone, where does this leave unions and other representative bodies that might be resistant to change? This is where you will find either the greatest resistance or the greatest assistance. Sometimes layers of middle management are inserted for no good reason. They are dead wood and must be removed, but they can occupy a very important position. Whether your information tends to flow bottom up, top down or side to side this is where data, information and knowledge smash into each other and connections are made. True again. Why do you or your business actually wish to innovate? Is it because it is the latest craze down at the Chamber of Commerce or are there good reasons for it such as flexibility sustainability, improved motivation etc. Are your aspirations as a management team aligned with those of your employees (and perhaps middle managers)? This article was inspired by a dialogue that I had with someone who commented on one of my blog posts. The post was about the resources that were required for Creativity. The person was looking for a definitive manual, a list of everything that they would need and the steps that they would need to go thorough. On reflection, my reply was probably less than helpful, but in a roundabout way I indicated that no such thing existed. I still maintain that this is the case and if anyone tries to sell you such a manual then beware, however what they really needed was something to learn from, perhaps some case study material for a situation similar to theirs. Putting together a creative system is a little like putting together flat pack furniture but without the instructions. If you have a reasonable skill level and knowledge of how such things are assembled then your furniture will grow out of the pile of pieces. If you are at the other end of the spectrum then you will be screaming for the instructions! But what if the instructions do not exist, simply because every time the furniture is built by different people the result is different (but still a perfect piece of furniture)? What you need then are not instructions but an example of how the pieces fit together and a list of the tools required so that you can construct your unique item of furniture. This is why we have components and tools to help you use creativity in business but the instructions are not included. This is a story about a lady (lets call her Mary) who works in the First Class Lounge at Cardiff Central railway station. If you have visited the lounge you will know the lady in question. On entering the lounge there is a comfortable, but not formal, atmosphere and your eye cannot help but see an enormous aerial photograph of the city. The caption at the bottom reads "Cardiff's best ambassador 2009". One often sees certificates and 'thank you' letters from charities mentioning sums of £100 or so, but those lining the walls here are for amounts in 4 figures. Clearly there is something going on here. Regular customers are greeted by name and their favourite drink poured for them, with stories exchanged. Clearly this is no ordinary employee (have you travelled by First Great Western trains recently?). With my freshly brewed coffee and neatly folded newspaper in my possession I sit back and eavesdrop on a number of conversations. It appears that the lounge is used as a waiting area for hotel guests who check out of their hotels early and still wish to browse the nearby shops. One passenger stays with the luggage and the rest shop. This obviously causes a problem. The lounge is frequented by managers who like to wait for their trains in comfort. They listen to Mary who is closer to the customers than they are and go away to work out the potential benefits/impact. The lounge is frequented by managers who know everything about running a company. They do not need information from employees at the bottom of the company in order to make good business decisions. Which of the above is closest to your situation? Which is the best for the company? Any employee at any level might be in a position to gather information whether they are a receptionist or a delivery driver. You might need to filter large amounts of data but you must keep your eyes open or risk missing potential opportunities or even threats to your business. Innovation 2010 is the title of a report published by the Boston Consulting Group (BCG) in April regarding the state of Innovation globally. There are a number of conclusions that can be drawn, but it is heartening to see that after a cautious 2009, companies are committing once more to pursuing Innovation during 2010. Innovation is now a top three priority for 72% of respondents to the BCG survey, the highest figure since the survey was first introduced seven years ago. In addition, 84% of respondents consider Innovation an important or extremely important lever for reaping the benefits of an economic recovery. Companies are backing up their statements with hard cash too as 61% of companies plan to boost spending on Innovation and 26% plan to increase spending by more than 10%. For a while we have been saying that there is the possibility of a new world order in Innovation and survey respondents also echoed this. Although Apple and Google top the list of most innovative companies less than half of those surveyed believe that US companies will remain the most innovative over the next 5 years. If we look at the first-time entrants to the most innovative list, all but one come from outside the US. One topical observation relates to the energy sector. Here BP rank number one and Exxon Mobil rank number four! So what are the implications for senior executives this year? Improving your innovation efforts this year are key. You have survived the recession, you must now beat the others that have done so. If you don't show a decent return on your innovation programme then someone will cut back on your funding eventually or find someone who can improve return. Your top team needs to be more 'holistic', embracing rather than merely supporting Innovation. You must keep looking over your shoulder. You might have a head start if you are based in a developing country but there are others who can run faster. If you would like to find more about how to improve your Innovation prospects please get in touch. There are many lists of how to do this and that, but what if you want to avoid doing something? What if you wanted to avoid being creative? If this is you, then follow these tips and you are well down the path to being as intellectually dull as ditch water! Follow the same routine every day, for everything. You will not see this because you have read item number one and think you know it all! Assume that your way of thinking is always right and your ideas are the best. Only pretend to listen to other people’s ideas, they know nothing. Play it safe, avoid taking chances. Never have a different sauce on your burger. Plan everything to the last detail BEFORE you start doing it. Pretend not to care and not to be inspired. Never take time to chill out and rest your brain. Believe that alternative modes of thinking are for actors and artists. Finally, if you recognise any of the above traits in your work colleagues then please get in touch. There is a chance that they can be saved. Since we have seen political and economic upheaval recently in the UK, Spain, Portugal and Greece, this quote seems topical. It is also a good example of re framing in order to sell a concept or to obtain good PR as opposed to actually solving a problem. Enjoy! For the past few years I have had a survey on the front page of my website. I ask one simple question 'What is the MAJOR factor that hinders creativity within your organisation? The options available are strategic barriers, organisational culture, corporate culture, process/structure, learning capacity, leadership/management. In my view, the two interesting points are the extremes. Very few people were highlighting strategic barriers (filtering, mindsets, risk profile etc) or the ability for their organisations to learn when these are potentially huge issues for an organisation embracing Creativity and/or Innovation. Also, since we have seen a global recession and financial crises, I would have expected these percentage figures to change as a result of 'digging in' during a crisis or through loss of capacity due to downsizing. It is not a surprise that over 34% of respondents blame Leadership and Management. Whether or not senior figures really are to blame, they are always likely to be a scapegoat. Once again I would have expected the results to change in troubled times. The biggest surprise of all is the number of people who selected organisational culture as the major factor that hinders creativity. Organisational culture is organic and is largely down to the employees. Even when a company is strict rather than benevolent, organisational culture tends to triumph. Have we not all heard of people banding together in the face of adversity? People are not saying that the culture is bad, just that it hinders creativity! Puzzling, so what does this mean? Without asking more searching questions (find out about our Innovation toolkit to get this information) we can't really say why these results are not changing when we expect them to, although one possibility is that the reasons behind the figures have changed. Finally, as well as being blamed directly, senior managers are also indirectly responsible for culture and structure. If your company had figures such as this and had troubles with creativity and innovation related issues then I would definitely want to do some digging. The chances are, a change of personnel is required somewhere!! At the end of last year I was interviewed by Dave Harries for GuruView.tv. You can see the result below. Visit GuruView.tv for other interesting and useful video interviews. Yesterday a huge story hit the news stands here in the UK. Within the Foreign Office a brainstorming session was held to do some 'blue sky thinking' around things that should form part of the Pope's forthcoming visit to the UK. As with all good idea generation sessions everything was recorded and the results marked not to be distributed externally. Of course, some of the ideas upset one or two people who took it upon themselves to make the document public. The BBC article can be read in its entirety by clicking here. DO make sure that your objectives are clear at the start, that way you will not be left defending your motives afterwards. DONT use any form of censorship, not even telling people to keep quiet. They won't. Get people to buy in to secrecy if this is needed in a commercial environment. If they spill the beans they are breaking the confidence of their peers and colleagues. DO make sure that brainstorming is not the whole process, some filtering has to take place to weed out the wacky ideas. DO publish the results yourself, others may well try to take things out of context. DONT be naive. In any political (in the true sense, not just government) environment there will be points scoring. Some people will go to extreme efforts to sabotage yours! ... and finally please do persevere. I'm sure that the Junior Official within the Foreign Office who has now 'been moved to other duties' did a good job and once the wacky ideas had been thrown away the Pope may very well have had some great events organised to complement the obligatory masses and baby blessings. A great opportunity missed perhaps? In the future people will be afraid to try new things so it could be a case of 'If you do what you have always done, the you will get what you have always got'. So please try and be a little different, but be careful! I have just finished creating this short (only 1 min 20 sec) video and will be uploading it to the website shortly. All my contacts who have seen it have said "get it into cyberspace now" so here it is. The music features the Kalimba and was heavily influenced by past visits to Latin America and Africa. It contains some nice notes but only if you listen with reasonable speakers! Higher quality versions are available offline and the website will have its own version soon, all without the post processing of YouTube. My view of an organisation that exhibits creative or innovative behaviour is organic and focuses on people. It therefore seems a good idea to use metaphors that relate to the wellbeing and performance of people themselves. So what does make us feel good or energised and what is not so good? How about a detox by way of a change in diet (as opposed to some of the unpleasant practices that exist at health spas)? As human beings we tend to feel sluggish when we have drunk too much alcohol or coffee or not enough water. We are told to eat foods high in fibre and cut out refined sugars and saturated fats. Lastly we can all eat less. Readers can take this metaphor as far as they like, as with most things it is simply another way of looking at our organisations to find new and different solutions to our problems. TV viewers here in Wales, UK may seen a documentary entitled ‘Ban The Boss’. It was made in conjunction with Dr Paul Thomas at the University of Glamorgan. The title was a little sensationalist to say the least, but the programme itself was very interesting. Following my article last month on what is wrong with public sector innovation I thought it right to shine some light on how things could be fixed. Despite the fears of those involved the idea was not to cause anarchy or make large numbers of people redundant but simply to make the changes necessary to create an organisational form that is relevant for the future. The programme focused on two main areas of Blaenau Gwent Council, Environmental Services (refuse collection) and Transport Services. Those who are involved in change know that there are essentially two options, top down and bottom up. In large inflexible organisations change orchestrated from the top is slow that it is ineffective. In the public sector the changes often take longer than the time for which key people are in post, making the whole effort grind to a halt. Dr Thomas went into each department and effectively banned all middle and senior management from their posts for a week. The idea was that the front line workers could organise themselves. As you can imagine, there were many different types of reaction. The bosses felt aggrieved, workers were suspicious and in some cases workers were wondering who would make the decisions. After a week workers were asked to vote to find out if they wanted their bosses back. Some were invited back but not in their original capacity but nobody was made redundant although some workers chose to leave of their own accord. It was clear to see that in the cases where workers had made the leap, their workplaces were happier and more efficient places to work with the flexibility to take on the challenges of the future. Rather like pouring concrete when building or filling a vessel with water, people and organisations find their own ‘levels’ and the previous structures were ineffective but were actually sapping the organisation of energy by just maintaining them. The benefits were greater efficiency, less red tape and increased motivation and performance to name a few. But what were the main factors that caused this to succeed? Overall it was a tough process but one which appeared to be working and one which is highly recommended to the public sector both in the UK and elsewhere. I recently had the good fortune to bump into Mark and Jon Owen at a business event in Cardiff and was immediately intrigued by both their product, and the way in which they had developed it and got it to the market. Those with design heads will of course marvel about ergonomics, design and manufacturing but what about the human side, what about (dare I say it) Innovation? I’m sure that Jon and Mark did not really see themselves as innovators but they are doing something different and making headway, so what happened? Mark had been a wheelchair user for over a decade and had been going with the flow. 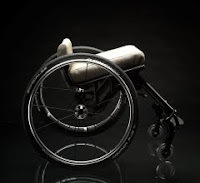 Wheelchairs were an engineering solution to a medical condition. Did that have to be the case? Had being confined to a wheel chair caused a major personality shift, changed his interests or priorities in life? No, but it had placed him in an entirely new bracket within society. He was now classed as disabled. One thing that struck Mark and Jon was the ugliness of mobility products. Just as we feel close to our iPhone or other gadget, so Mark had a gadget that was with him all of the time which was transport, sofa and office chair - so why couldn’t it be cool too? Nomad was born! Why hadn’t this been done before, why did nobody see this opportunity? Was it market, was it international conglomerates or blinkered stakeholders (you decide)? With an emphasis on design and with access to a unique perspective on the marketplace a unique wheelchair was born. Made of lightweight aluminium, engineered to provide day long comfort and requiring less effort it sure does look cool, even people who are not disabled will want to have a go! You can even propel yourself with one hand! So how did they get here and more importantly how did Mark and Jon start out? A discussion whilst on holiday convinced them that this was possible. Time out to think is always important, without it the results could have been a badly engineered product in a garden shed! Inspiration was drawn from a variety of sources, not just pinching ideas but values and lifestyle cues as well. So take a look at a Nomad chair and you may very well see hints from cars, bikes and fashion. All good stuff but knowing what you want is great, how do you actually get there? Usually this means engaging outside help to acquire the skills that you yourself do not possess. It also means that you also have more people to bounce ideas off and gain inspiration from. In this case, local designers were the key. Was it all plain sailing? Jon says that prototyping was a little tricky as others do not always wish to push the boundaries, but they can be convinced if the vision is strong enough and the message is compelling. How many people say to you “that will never work”? Being brothers of a similar age, Mark and Jon often disagree but seem to have a fairly comprehensive support system that includes both each other and parents so (creative) tension is channelled into Nomad and is seen as a positive factor. Do readers of this article actually think about their own environment, support mechanisms and close advisors? Mark and Jon seem to have created an effective ‘mash’ of traditional and innovative with their approaches to design, planning, risk assessment, company culture and having fun. They have balanced risk and planning, creativity and control but above all they have an in depth understanding of their environment (both internal and external) and are revelling in the challenges and opportunities that they are discovering. By coincidence, these are also the main drivers to ensure that a business has a (high) capacity to innovate. The future looks bright for Nomad. This blog is now located at http://blog.creative4business.co.uk/. This article is based on thoughts and observations rather than research, and is meant to stimulate some thinking on the topic. There will be some generalisations and hence some exceptions can be found also. In this context I define the Public Sector as everything that is not Private thus education and Not For Profit are included also. Innovation is taken to be some sort of system where processes and behaviours are changed to create value and improve output rather than the shiny new gadget that has just come from a high technology start up company. The big question is ‘Does the public sector innovate?’ and the straight forward answer is no it does not because it cannot. I know of examples of medical innovations within the National Health Service which are exceptions to the rule but the system as a whole does not innovate. One argument that I often encounter when challenging people on this issue is that their work is governed by rules laid down by government, both local and national. If you provide a service then those rules normally prescribe what happens or must happen at the point of service delivery not what goes on within the body providing the service. So the world is your Oyster as far as Innovation is concerned. So what prevents Innovation? First of all there are hundreds upon hundreds of self imposed rules or boundaries (see my article on Innovation By Breaking Rules) which are justified by statements such as ‘That is the way we have always done things’. Why is that? What can be changed, rearranged or replaced to improve the quality of what is being delivered? How many people challenge the boundaries? Targets are a huge issue. I encourage readers to read ‘Freedom From Command And Control’ and ‘Systems Thinking In The Public Sector’ by John Seddon who has a lot to say on this matter. Badly formed targets only encourage behaviour that is designed to meet targets, not to improve service delivery or create value. Many organisations (including private sector) have experienced the touch of Business Process Reengineering (BPR) gurus who have stripped down and rebuilt public sector systems that work poorly. John Seddon talks of ‘value demand’ (demand on a public service) and ‘failure demand’ (demand by way of failure such as complaints or having fragmented information). Our streamlined front/back office systems are candidates for large amounts of ‘failure demand’ and hence wasted energy (but they do meet their targets!!). Another complex issue revolves around Human Resources and the Unions. I shall not blame either party but simply illustrate a situation that needs resolving. In much of the public sector, HR has been centralised as Employment Law has become more complex thus responsibility for some soft management issues has been withdrawn from the front line (and some managers may have welcomed this). HR has become more about Employment Law and not getting the best out of the workforce. Even when an employer wishes to reorganise the workforce they come against the Union who are quiet rightfully there to protect the rights of workers. They often start their negotiations from the point of view of ‘change is bad’. Another factor that does not assist is the fact that public sector recruitment and working revolves around the job description and person specification which HR would dearly love to change and the employee and the Union would not (unless there is some compensation). Why is this so? Why can’t contracts of employment describe behaviours and responsibilities rather than actions and qualifications? Currently in the UK, we are getting ready for significant cuts to spending in the public sector which should spur us on to trying something radical to maintain services to ratepayers and taxpayers. The current economic climate presents a possibly unique opportunity to sow the seeds of Innovation. The danger is that the public sector will be made weaker by simply chopping off bits and not reorganising the remnants or outsourcing to organisations that are still based on a front/back office system that has high failure demand. The justification is that this is what happens when public sector spending is cut. The conclusion regarding the question ‘does the public sector innovate’ is still ‘no it does not because it cannot’ but also that ‘it does not because those in charge (politicians and civil servants) simply will not’. We can do something about it, if somebody will let us. There are rules, and there are rules as many pioneers tend to say. Don’t worry, we are not going to break any – for now! I was reading and article recently that stated that in order to innovate we must challenge or disrupt at least one of the fundamental principles or rules that we operate by in our chosen sector. I thought about this for a while, thinking it might sound radical to some people, and then decided that the statement was perfectly true. … and the list goes on. Try creating your list and see how many are a) self imposed b) could be broken without affecting anybody else c) could be broken by everyone to make life better (or improve profitability). What could this new found freedom to act and think give you or our business? Perhaps time to create new products or services or simply improve existing ones. Don’t just ask questions about how you work, ask about industry sector, materials used, supermarkets supplied etc. We all conform to rules and create boundaries which we then become constrained by for no good reason. Try breaking some rules and see what happens, don’t think of it as breaking rules, just think of it as stretching boundaries. If you are the nervous type who does not want to act and then ask for forgiveness later try telling your boss or colleagues that ‘If we broke rule x or rule y then it would be possible to …’. And one final thought, if you do not wish to be branded an anarchist, tell people that you are performing Boundary Analysis rather than rule breaking! I notice that a number of people play this game in their workshops but here is my version. It can be used in a number of different ways and can also be used solo or in groups. Only we have the technology …. This should not be too difficult, especially if you are already having some success but if you cannot find statements of the above type that describe why your products and/or services are unique then you are probably flogging a dead horse and should consider cutting your losses. It is then time to use this technique in a different way. You might have already created some new ideas which are still in your head or are just scribbles on a piece of paper. Try the same exercise but using knowledge of your capabilities and resources create statements of the form ‘Only we could …’. This might require some knowledge of your competitors as well so some digging will be required. Once again, if your product or service ideas fail this simple test then perhaps they are not worth pursuing. So you can work out your unique advantage assuming that you can meet the conditions of your ‘If only …’ statement. This is a little easier and can usually be carried out with the aid of a calculator. If you are a larger business then you might wish to involve employees from all areas and at all levels in this exercise. Be realistic though, ‘If only we had infinite resources, we could do anything’ is not an option if you are trying to make a decision although it might be good for generating some wacky ideas. Do you live in South West England? Would you like to spend a day learning how to use creativity as a business tool? Then come to my workshop at the University of Bath on March 31st 2010. Your total investment is only £43 including lunch. Find out more by clicking here. If you would likea workshop run within your own business the please get in touch directly. This is just a quick note about Open for Creativity, a new FREE service that is intended to help people with issues that they may have surrounding using Creativity as a business tool or when things do not go as intended with innovation projects. If you have any Leadership or Management problems in these areas then we can deal with those too! We cannot get into long diatribes for each issue but if they can be succintly put into an email or tweet then please send them in and we will endeavour to respond within an hour or two in an equally concise manner. You can find contact details here or you can use our enquiry form. You can also contact Derek Cheshire on twitter (@derekcheshire). Most people reading this will know of the freezing weather that gripped the UK over the Christmas and New Year periods together with the associated problems. Although there was some panic buying of food in the shops, by and large we survived unscathed. Did this mean that when the road conditions were appalling, my local supermarket was making superhuman efforts to deliver my Cornflakes? Towards the end of the freeze I went to a local supermarket and was wandering up and down the aisles when I overheard a conversation between two of the department managers. The first was obviously toeing the company line and said something like "the shelves have been full, the supply chain has been doing a great job". Nice, I thought, he recognises the contribution of drivers and warehouse staff in difficult circumstances. The second manager said "there were less people going to the supermarket because of the bad weather". It did not matter to me, since I was getting what I wanted, but it highlights a valid point. Accepting observations about full shelves without looking at all the facts meant that I was making a number of assumptions. If I was the supermarket manager I could be patting myself on the back believing that the arrangements I had put in place worked well. Next time there was a big freeze I could do exactly the same. But what if the local council gets better at clearing roads, or everybody buys four wheel drive cars? More people will arrive at the supermarkets and the food may disappear. Do you think that this is what happened to many of our businesses between 18 months and two years ago? There is no need to become highly cynical, but learning to question the status quo and challenge assumptions is an essential component of an innovation system. If you subscribe to this blog using the feedburner feed http://feeds.feedburner.com/creativityandinnovation then you can ignore this posting. If you subscribe using http://www.creative4business.co.uk/blog/atom.xml or http://www.creative4business.co.uk/blog/rss.xml then please be prepared to either change to the above feedburner feed or locate the appropriate feed via the Blog tab on my website http://www.creative4business.co.uk/ after March 26th. The reason for this is that Blogger is withdrawing support for FTP publishing after this date, and so the published blog will be moving, probably to blog.creative4business.co.uk. However, to avoid confusion in the future I suggest that followers switch to the feedburner feed which will be automatically updated at the appropriate time. Story is one of the best and easiest ways to communicate meaning, rather than just spraying out words like we tend to do from time to time. I came across this little gem the other day which seems apt and needs no further explanation. I do not know the author so if you have come across this before and can attribute the author please let me know. This story is about a man who once upon a time was selling Hotdogs by the roadside. He was illiterate, so he never read newspapers. He was hard of hearing, so he never listened to the radio. His eyes were weak, so he never watched television. But enthusiastically, he sold lots of hotdogs. He was smart enough to offer some attractive schemes to increase his sales. His sales and profit went up. He ordered more and more raw material and buns and sold more. He recruited more supporting staff to serve more customers. He started offering home deliveries. Eventually he got himself a bigger and better stove. As his business was growing, the son, who had recently graduated from college, joined his father. Then something strange happened. The son asked, "Dad, aren't you aware of the great recession that is coming our way?" The father replied, "No, but tell me about it." The son said, "The international situation is terrible. The domestic situation is even worse. We should be prepared for the coming bad times." The man thought that since his son had been to college, read the papers, listened to the radio and watched TV. He ought to know and his advice should not be taken lightly. So from the next day onwards, the father cut down the his raw material order and buns, took down the colourful signboard, removed all the special schemes he was offering to the customers and was no longer as enthusiastic. He reduced his staff numbers. Very soon, fewer and fewer people bothered to stop at his Hotdog stand. And his sales started coming down rapidly and so did the profit. The father said to his son, "Son, you were right. We are in the middle of a recession and crisis. I am glad you warned me ahead of time." This is an old Apple promo video that has reappeared with the release of the iPad. It features many characters that at the time were regarded as crazy in some way. Yet their craziness, curiosity, creativity and desire to disrupt the status quo had a lasting effect on all of us. So can we learn from this? Is crazy good and just how much of it do we need, after all it is a powerful phenomenon. So just how far should we be prepared to go to try and change things? How far would YOU be prepared to go? I was recently taking part in an online discussion about Creativity and Innovation when one of the contributors posted something that just stopped me in my tracks. There were a few words about how Creativity and Innovation are not the same (about the only thing we did agree upon) and some very logical and left brained words about how Innovation can be managed and then the line "Creativity cannot be managed". How come you cannot manage Creativity, but you can manage Innovation (which contains Creativity)? The rest of the article led me to believe that the author did not have a realistic grasp of the situation. As the person was obviously keen on following manuals to the letter, I had to agree that there is no manual for Creativity (one of my slogans as it happens), but we know enough to be able to manage creative and idea generating processes very successfully indeed. There is much documentation on creative techniques for solving problems, generating ideas and making decisions. We know which ones work best for different types of working, and there are many guiding principles to help us set up our environment and ensure that creativity is nurtured. We know the best ways to capture ideas and share them, we can calibrate idea generation pipelines and we know the ideal characteristics for creative team members, creative teams and of those who try to manage them. Better still we know how creativity fits into the process of Innovation as a whole, so how can anyone claim that Creativity cannot be managed? The answer lies in perspective. Many consultants and advisers think that Innovation is something that you do to a system i.e. you apply it by turning a handle and following the book rather than a framework and a set of behaviours that help you to innovate. Thus they get stuck when it comes to Creativity, you cannot just do it, there is no step by step guide to the whole process yet the principles I mentioned previously can be applied (within your individual context) to create a measurable and hence manageable system. There is no manual that says exactly how to do this or how much you are likely to spend innovating but here is a common sense approach that seems to work well. Imagine that you are a company that needs to introduce 5 new products into the market place. First of all you need to spend some time generating ideas. Without knowing your actual method of idea generation and until you have had time to calibrate your own process then this is a bit of 'wetted finger in the air' calculation. We know that the ration of truly wacky ideas to those that might be worth looking at is one order of magnitude i.e. 10 to 1. Similarly, the ratio of 'might be worth looking at' to 'definitely worth a look' is once again an order of magnitude. So if we want to have just one idea that is worth pursuing then we should expect to generate at least 100 crazy ideas, thus our small company wishing to create 5 new products will need at least 500 crazy ideas. So far so good, but how do we generate the ideas? You could collect them in a suggestion box but the quality would be variable and it may take a while although the cost would be low. An idea generation session with a group of people could generate your ideas in less than a day. This would be more expensive and would only use a 'snapshot' of the expertise and knowledge available to you. By now you should get the idea that we can roughly work out how many ideas are required, and how long this would take and the resources that would be used. Not all ideas make it to products so some extra redundancy needs to be built in, and then there are overheads such as management and the costs of prototyping and manufacture, but these should be aspects with which you are already familiar. This is a simple guide but good enough to allow you to get some sort of handle on the cost of Innovation if you have never done anything quite like this before. Reality is a little more complex - good luck. The Royal Society is known the world over for the contribution of its members in the field of Science. The Royal Society is celebrating 350 years since its founding to promote science, technology and engineering and it numbers many famous names amongst its fellows including Christopher Wren, Stephen Dawkins, Stephen Hawking and Tim Berners Lee. This small band is well known for their achievements and perhaps not so well known for being cantankerous, awkward and in some cases downright dangerous. No, BAD is not an acronym. I simply hate brainstorming and try to avoid it wherever possible. This stems from an introduction (many years ago) to the type of brainstorming that we all hate - sitting round a table with a pile of Post-It notes being told by the boss to come up with ideas. I objected because we never got anywhere and a great deal of time was wasted. Some people do, however, use brainstorming and have some success. There are a significant number of people who do not. Why is this? Simples, as a well known Meerkat might say (apologies if you live outside the UK). Creative problem solving is a series of phases which alternate in using convergent and divergent thinking (focusing on one thing or generating many options). If you wish to generate ideas you need to know the objective. What are you generating ideas for and is it really the right thing to be doing? This is convergent thinking and needs to be done and there are even creative techniques for this part of the process. Next comes a divergent phase to generate options. This is where brainstorming comes in. All techniques can be categorised according to whether they are convergent/divergent, group/solo etc so it is essential to use the correct type of technique in corresponding phase. So use brainstorming for divergence - it is a divergent technique. And this is where those who tried to get me started went terribly wrong. We sat round a table using a divergent technique to 'solve a problem' without working out exactly what the problem was. The only way this would have worked is by pure luck (and we never got lucky). There are other issues of course regarding environment, group make up etc but if you use the wrong tool for the job it is not going to work no matter how hard you try.